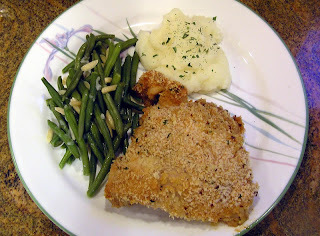 Oven-fried chicken is so delicious, I thought I'd try a variation of a recipe posted a few years back. Last time it was "buttermilk" chicken, where soy milk plus lemon juice equals buttermilk substitute. But it's not thick and creamy like the real thing. So I figured ... why not try marinating with thick and creamy parve yogurt instead? Except there didn't seem to be a true non-dairy yogurt available at my local supermarket. The Try-n-Save carried only one brand that, while labeled non-dairy, also sported a dairy hechsher (certification). Until last week, when I spotted a new (to me) yogurt that was truly free of dairy cooties. At 5PM Sunday night I suddenly wanted cookies. Luckily I booked this recipe from Serious Eats, because it was easy to mix, bake, cool, then make and serve dinner (tacos, in case you were interested) and still have time to wash dishes and enjoy a cookie or three with a cup of tea before midnight. 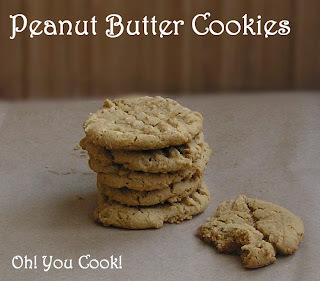 Only five ingredients to make these cookies! No flour, no dairy products (unless you count the egg) and no "strange" or exotic gluten-free products contained therein. You probably already have all the ingredients in your kitchen.